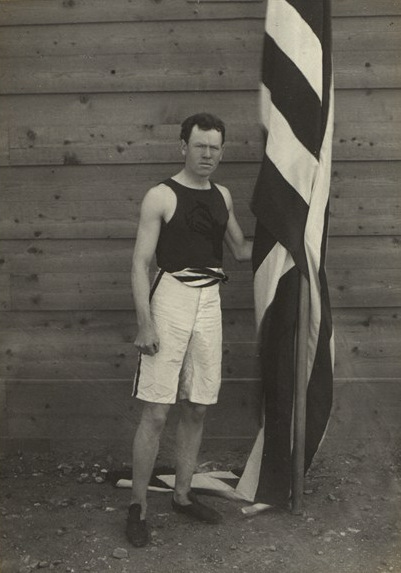 Did you know that the first Gold Medal winner in modern Olympic history was the son of Irish immigrant parents and that Irish athletes dominated Olympic track and field events for the U.S. for the first two decades of the 20th century? The first to win was James Connolly and he was born on October 28, 1868 in the impoverished section of south Boston. He grew up with a love of sports and when an International Olympic Committee resurrected the ancient Olympic Games to be held in Athens in April, 1896, Connolly requested a leave of absence from Harvard to participate and left for Greece. After arriving in Naples he was robbed and had to take a later train; he arrived just in time for the Games but too late for practice. The first event on opening day was the triple jump, involving three successive jumps. It was one of the original competitions in the Ancient Greek Olympics. In Ireland, the geal-ruith (triple jump) was also an ancient event, contested in Irish games as early as 1800 BC. Connolly entered and finished more than a meter ahead of his nearest opponent by jumping 44′ 11″. He became the first Olympic champion since 385 AD receiving a First Place Silver medal since Gold medals were not yet established. He went on to take second place in the high jump (5′ 5″) and third place in the long jump (19′ 2″). As for the rest of his team, a total of 14 athletes from the US competed and were the most successful nation with 11 First Place medals. Overall, the American team had 27 entries in 16 events, with 20 of the 27 finishing in the top three places. Back home, the team was welcomed enthusiastically and Connolly was presented with a gold watch by the citizens of South Boston. After he died in New York on Jan 20, 1957 at age 88, a book on the 1896 Olympics recorded that, James Connolly became the first known Olympic champion since Zopyros of Athens in the 291st Olympic games held in 385 AD. His memorabilia, including the initial First Place medal in modern Olympic history, is housed in the library of Colby College, Maine. Connolly inspired more Irish into the Olympics on America’s behalf since Ireland at the time was under Britain and they refused to compete for the Crown. Between 1896 and 1924, a group dubbed by the newspapers as the “Irish Whales” because of their large, mucular apperance won everything from Amateur Athletic Union national championships to the Olympic Games. The Irish Whales were John J Flanagan and Paddy Ryan of Limerick, James Mitchell and Matt McGrath of Tipperary, Pat McDonald of Clare and of Mayo. Sheridan at 6’3″ and 194 pounds was the lightest but what he lacked in girth, he made up for with his athletic accomplishments, winning nine Olympic medals. Matt McGrath was 6′ tall and 248 pounds. Flanagan was about the same. 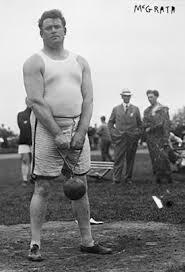 Paddy Ryan was 6′ 5″ and 296, and Pat McDonald was 6′ 5″ and 300 pounds. They were all members of the Irish American Athletic Club, the NY Athletic Club and, except for Ryan, were all members of the NYC Police Department. Arthur Daly in the New York Times, wrote that they got their nicknames on the train trip to the Olympics of 1912 in Sweden. He wrote. Those big fellows all sat at the same table and their waiter was a small chap. Before we reached Stockholm he had lost twenty pounds, worn down by bringing them food. Once, as he passed me, he muttered under his breath, ‘It’s whales they are, not men.’ They used to take five plates of soup as a starter and then gulp down three or four steaks with trimmings. Flanagan won Gold in 1900, 04 and 08 and Silver in 04; in the 1908 Olympics in London, he broke his own record with a hammer throw of 170 feet, 4.5 inches; the Silver went to the former record holder Matt McGrath. Flanagan later returned to Ireland upon the death of his father. 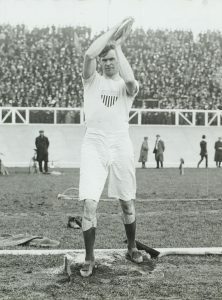 McGrath won Gold in 1912 setting a record that stood for 24 years and in 1924 won Silver setting an unbroken record for the oldest person ever to win an Olympic medal. Mitchell won Bronze in 1904 and Martin Sheridan won Gold 5 times in 1904, 06 and 08. Perhaps the most memorable legacy of these great athletes was set at the 1908 Olympics held in London where many medals were won by Irish athletes representing America, not the least of which were the Irish Whales. During the Parade of Nations, it was customary for teams to dip their nation’s flags in a show of respect as they passed the ruling monarch of the host country. Martin Sheridan of the American Olympic team was scheduled to carry the American flag. Everyone knew Sheridan held a grudge against the English because of the Great Hunger 60 years earlier so coaches of the Olympic committee replaced Sheridan with Ralph Rose as flag bearer. It should be noted that these Irish athletes also had a strong sense of patriotic pride to their newly adopted country and as the American team approached the Royal Box, Matt McGrath broke ranks and stepped up to the American flag bearer and said, Dip that flag and you will be in a hospital tonight. The flag was not dipped and it caused an international incident. During a news conference later, Martin Sheridan spoke for the entire Olympic team when he pointed to the American flag and said, That flag dips to no earthly king. A precedent was set that is followed to this day. During the Olympic Games or on any occasion on land or at sea, the American Flag has never been dipped to anyone since that day in 1908. In fact on June 14, 1923, the U.S. Flag Code was adopted to read, No disrespect should be shown to the flag of the United States of America; the flag should not be dipped to any person or thing. Now, June 14 is remembered as Flag Day and you can look for that historic moment to be repeated at future Olympic opening ceremonies thanks to an Irishman. They were just a few of the Irish who helped to make America great. 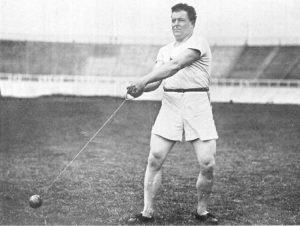 America’s Irish continued to dominate Olympic throwing events until the 1928 Olympics when the U.S. lost for the first time in the hammer throw event. They lost to an Irishman, Dr. Patrick O’Callaghan, who was competing for the new Irish Free State. He had been trained by John J Flanagan – one of the whales who had gone home!